The Bahía de Banderas region, which includes the Riviera Nayarit and Puerto Vallarta, solidifies its standing as a sports destination par excellence. 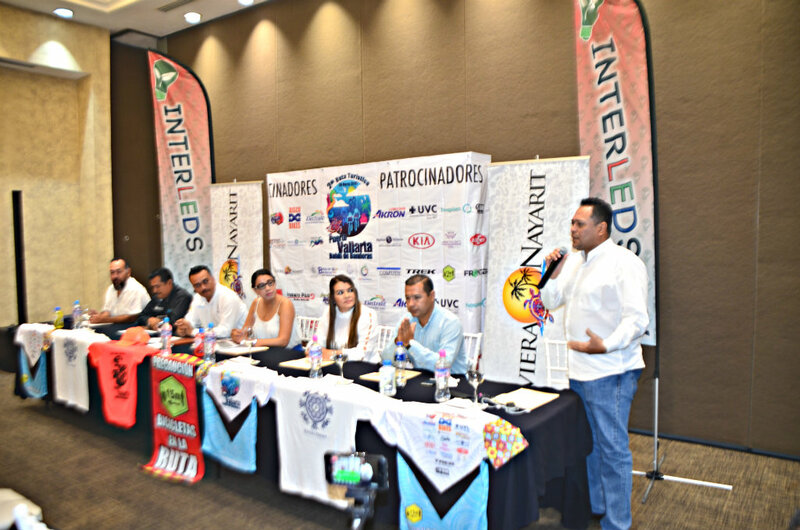 The Bahía de Banderas region has solidified its standing as a sports destination with important events that not only promote physical activity but also generate thousands of visitors and contribute to the promotion of tourism. The 2nd Puerto Vallarta-Bahía de Banderas Tourism Route stands out on this list of events; it will take place on Saturday, March 30, 2019 with the participation of professional and amateur cyclists. During a press conference held on Tuesday, March 26, the organizers offered details on the ride that includes three routes that start and finish in Marina Vallarta: The Green Route at 21 kilometers; the Black Route at 72 kilometers; and the Red Route at 100 kilometers. “The Tourism Route isn’t a race, it’s a family activity where we invite everyone who owns a bicycle to participate in the hopes of encouraging sports and togetherness, as well as promoting Puerto Vallarta and the Riviera Nayarit’s natural attractions,” said Francisco Javier Ortiz Aceves, event founder and managing director. Over one thousand cyclists are expected to participate and enjoy this ride through nature, said Silvia Duarte, groups and events manager for the Riviera Nayarit Convention and Visitors Bureau (CVB) and the Bahía de Banderas Hotel and Motel Association (AHMBB). She stressed that the cycling event attracts an important number of participants, mainly from other states in Mexico, although there is a substantial number of local participants as well. The proportions are 60% and 40%, respectively. During his speech, event co-organizer Roberto Palacios shared the details of the route that will begin in Marina Vallarta at 7:00 a.m. on the dot with the first group (Advanced) leaving on a 100-km ride towards Punta de Mita. The second group (Intermediate and Advanced) leaves at 7:05 a.m. on a 72-km ride to playa La Manzanilla in La Cruz de Huanacaxtle. Last but not least, the final group (open to the public), leaves at 7:10 a.m. on a 21-km ride to the Agustín Flores Contreras Athletic Center, then on to Las Juntas before returning to Marina Vallarta. There will be water stations and mechanical assistance along the route. Registration is open and the cost depends on the distance of the ride; registration closes on March 29th. Upon registration each participant will receive a kit with a souvenir t-shirt, a medal, a rider number, and health insurance (with restrictions), as well as the chance to participate in a raffle for a Trek Domane AL3 bicycle, courtesy of Xisco Bikes. Organizers stressed that security is a key point, so the event will enjoy the support of the municipal authorities. 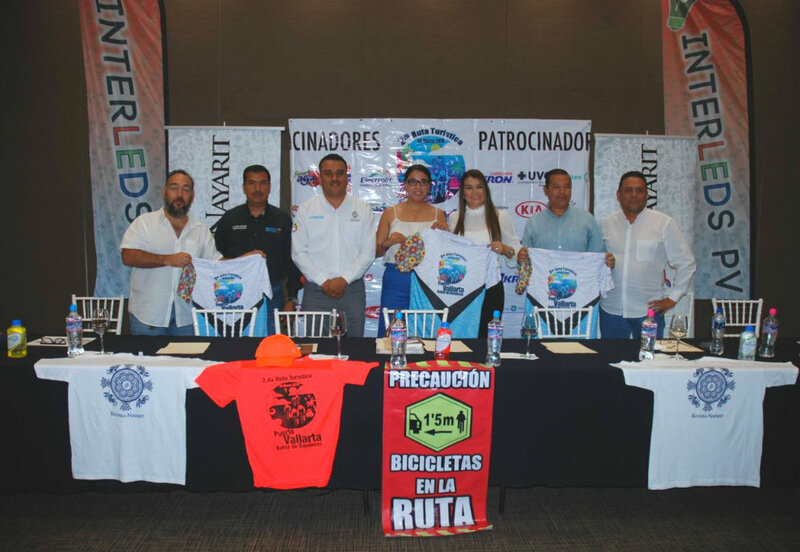 Units from the Puerto Vallarta and Bahía de Banderas Civil Protection and Municipal Transit police will be on hand to safeguard the cyclists. Claudia Guzmán Vidal, director of Economic Development of the Bahía de Banderas City Council; José Amador Hernández Madrigal, director of the Puerto Vallarta Municipal Sports Council (COMUDE); Joaquín Carías, liaison for the State of Nayarit Ministry of Tourism in Bahía de Banderas; and Jorge Eduardo González Ríos, assistant director of education at the Bahía de Banderas City Council were also present at the press conference. For more information: www.rutaturisticapv.com | Facebook: Ruta Turística Puerto Vallarta. The Riviera Nayarit Convention and Visitors Bureau (CVB) and the Bahía de Banderas Hotel and Motel Association (AHMBB) continue to work together to advance the region, strengthening its promotion and helping position Mexico’s Pacific Treasure on the national and international map with the support of the Government of the State of Nayarit via the Tourism Promotion Trust (Fiprotur).